Will this plugin make your keyboard playing sound better? CodeFN42 has released a potentially useful new Windows plugin known as Cales. 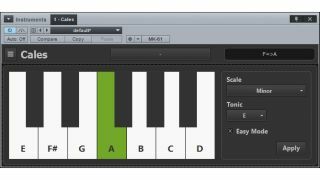 This simple VST tool maps a specified scale to your MIDI keyboard, meaning that bum notes should become things of the past. More than 20 scales come included, and you can add your own custom scales. There's also an easy mode which enables you to play any scale using only the white keys. With this engaged, C is always the tonic/root note. You can download Cales as a 32/64-bit Windows VST plugin from the CodeFN42 website.